I've been having this problem. Because I haven't learned to talk yet, I can't tell mummy when I am full. It is a bit annoying when she keeps spooning the food in. Yesterday I learned to blow raspberries with my mouth. Now when I am full, I stop swallowing and start blowing raspberries with my food. 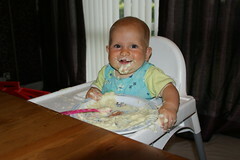 Mummy doesn't seem overly pleased when I do this with my morning porridge though!